One or both of us is being selfish. Self focused, self serving, self righteous, self reliant, self seeking. I find that life is a huge tug of war as I strive to take care of self, do what’s good for self, and keep self healthy – all while denying self. Phew, this is not an easy task. It is possible to do both (deny self and take care of self), but in my experience, it takes continual effort and surrender to the Father. If I’m focused on letting the Spirit be at work, my desire to live by selfish (flesh) tendencies fade. None of this happens if I’m not intentional about choosing a surrendered heart so that God can do His work – in me and in my marriage. At one particular dark (selfish) point in my life a few years ago, I found myself angry almost constantly. In my mind, Matt couldn’t do anything right, and I was struggling mightily to move past lies I was believing. Clearly my struggle wasn’t against Matt. It was against the Enemy. Thank God that He is more powerful and has already won the victory over the Enemy and all that causes us to be selfish! 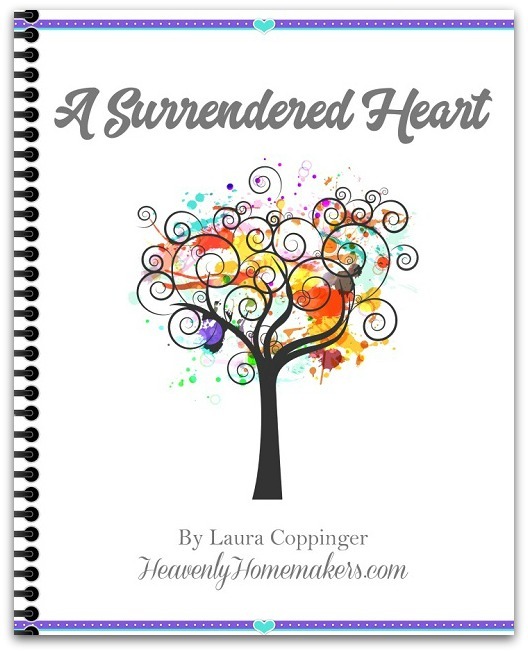 During this tough journey of learning that I need to get on my knees and surrender my heart to be completely open to the Spirit’s work in my life and in my marriage, I wrote A Surrendered Heart series. Writing my way through it, working my way through it, praying my way through it – God offered so much healing! But it wasn’t just a one-and-done kind of journey. I’ve found that I benefit (and my marriage benefits!) each time I work my way through these lessons. I need frequent reminders of my need to surrender my heart so I can stay away from selfish behaviors that hurt my marriage. After realizing how beneficial these lessons are and how much more they could become if developed into something bigger, we’ve put them all together in a gorgeous Mini-eCourse for everyone! 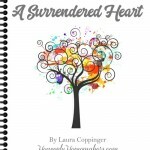 Six lessons filled with Biblical instruction, encouragement, worksheets, journaling pages, and scripture printables fill 42 pages that you can work through over and over to remain in a state of beautiful surrender.